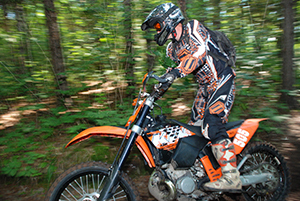 Located seven miles east of Brainerd, the Miller Hills Trail has 14 miles of riding on narrow, twisty single track trails for experienced off-highway motorcycle riders. This trail is provided by Crow Wing County and Northern Lites Cycle Club. Trail closings | Trail map | Not a resident of Minnesota? Buy your trail pass and find an ELS by the county the trail is located. From intersection of Business Highway 371 and Highway 210 in Brainerd, take Highway 210 east for 7.5 miles. Turn north onto Sploezens Road. Proceed 0.7 miles to parking area. Narrow, twisty single track trails for experienced off-highway motorcycle riders.